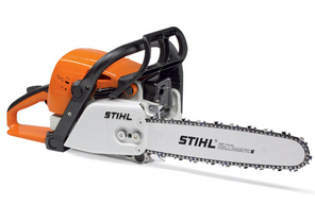 Stihl Chainsaws for sale | MS231 | MS251 | MS271 | MS311 | MS391 | Northern Ireland. Stihl Chain Saws 16, 18 & 20 inch. Call us on 028 (from ROI 048) 302 66665 for further information. Stihl Chain saw MS 231 16 inch bar. Excellect power to weight ratio. Ideal for cutting firewood and for building with wood. Also suitable for tree maintenance and for felling small trees. The Stihl MS231 is ideal for tree trimming or cutting firewood. 3/8 picco chain with 16 inch bar. Stihl Chain saw MS 251 16 inch bar. on the market. Available with 16"/40cm guide bar and chain. The Stihl MS251 is ideal for tree trimming, cutting firewood and light felling. .325 chain with 16 inch bar. 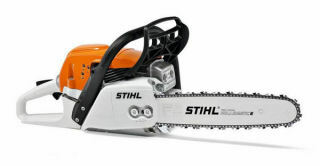 Stihl Chainsaws Northern Ireland - Available to customers all over Ireland - Why pay more? Stihl Chain saw MS 271 18 inch bar. system with pre-separation and professional anti-vibration technology. The Stihl MS271 is a powerful 50.2cc saw for farm or general use - with Deco valve. .325 chain with 18 inch bar. Stihl chainsaws MS271 - when you need more power. Stihl Chain saw Farm Boss MS 311 18 inch bar. without 2-MIX technology. Has controlled-delivery oil pump. The Stihl MS311 is a powerful 58cc saw for farm or general use - with Deco valve. 3/8 standard chain with 18 inch bar. Stihl chainsaws MS311 - when you need more power. Stihl Chain saw Farm Boss MS 391 20 inch bar. Stihl MS391 - even bigger and more powerful than the MS311 - with Deco valve. 3/8 standard chain with 20 inch bar. Back to our chainsaw page for prices.